In order to maintain healthy hair you should have a regular trim schedule. On the Coily Queens Regimen you are encouraged to trim every 4th month. Only trim what is needed. If you follow the CQR, you will not have to trim more than .25 of an inch each time. So you will only trim one inch per year. Trimming like this will help you retain more length and reach longer lengths faster. Following the CQR principles will take you to waist length and beyond if you desire! Keep a natural hair journal and log your trims. When it is time for your trim, schedule them on high energy days. 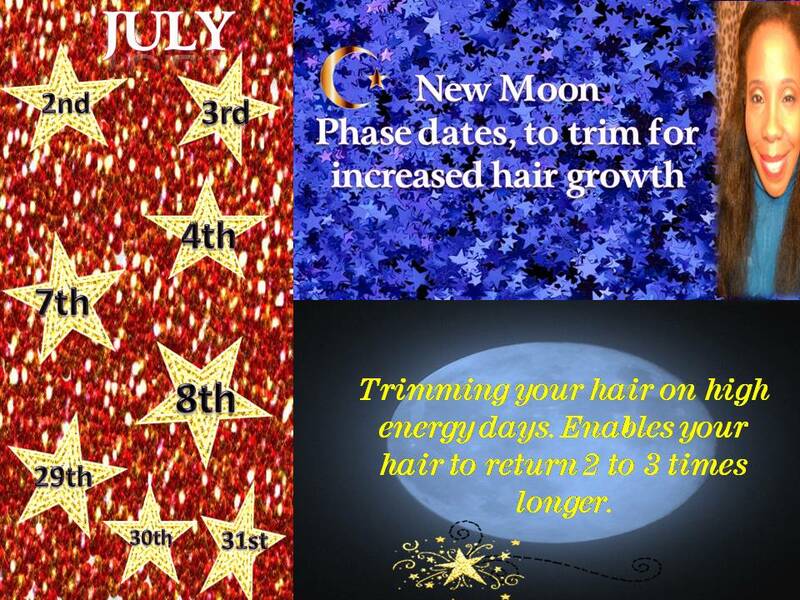 Every month you are provided the best New Moon phase days to trim, in order to maximize hair growth. So while you might trim 1/4 inch, you will regrow double or triple that. When you trim on the right days. New Moon Phase trimming is an ancient concept. Man was created with the ability to read the earth. Farmers plant according to the phases of the moon. For more articles on New Moon Phase trimming please search this site. There are dozens of articles here.